Geranium, Zonal Geranium - Annuals or houseplants with brightly colored bloom clusters amid large rounded foliage. A favorite in the garden or in containers. Ivy varieties trail and are excellent for hanging baskets or flower boxes. Long blooming and tough, they will provide an entire season of color. Appleblossom - Pelargonium honorum - Uniform plants are covered with 6 inch clusters of single pink and white bicolor blooms. Great bedding or container plant. Full sun; height: 12in. Black Magic Series - Pelargonium honorum - F-1 Hybrid. A real standout in any garden or container. Foliage is dark green - so dark as to be nearly black - edged in a narrow strip of bright green. The 5 inch bloom clusters are a contrast to the foliage. 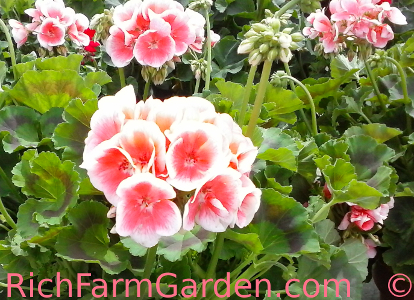 Double Geranium - Very hard to find double flowered geraniums with bright green foliage. Strong plants bloom all season. Flower clusters measure up to 5 inches in diameter and resemble clusters of baby roses.